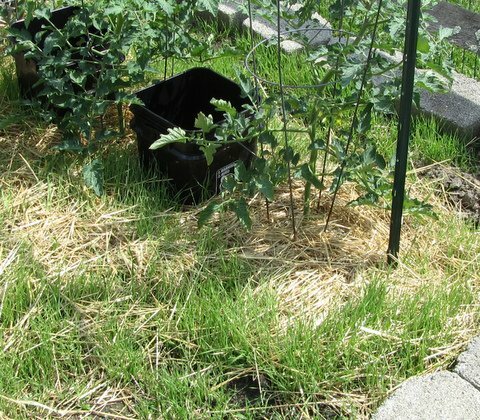 I have a new problem—living mulch—in the Tomato Patch, and I hope you will tell me how you think I can solve the problem. 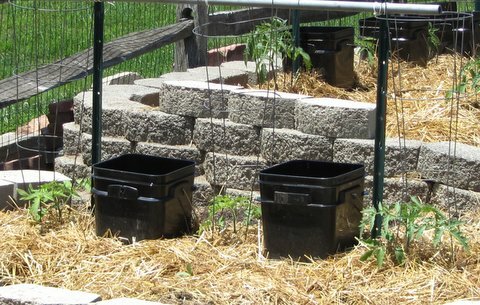 I mulched most of my rows of tomato transplants in my usual way—sheets of newspaper covered with a thin layer of straw. About a third of my plants are mulched just with straw because I ran out of newspaper. Most years I discover one or two volunteer wheat plants—or maybe they’re barley—in late June or July—from seeds that hitch-hiked in with the straw. I’ve always pulled those few volunteers without a thought. This year, however, I have hundreds—no, thousands—of volunteer grain plants—weeds, if you will. Tomato Patch looks like a newly seeded lawn sprouting in the springtime. I think some farmer must have harvested his grain before it was fully ripe and much of the grain ended up in bales of straw for sale at a local farm-supply store instead of in a bag of flour or chicken feed. What should I do? I can easily hoe the volunteers at the edges of the rows, but how should I attack the living mulch in my rows of tomato plants? It’s growing on top of the newspaper in places and directly in the garden soil where I hadn’t used newspaper. Help! If you have a suggestion, please post a Comment—soon. I’ll let you know later how I solve this baleful problem—if I do indeed. Here is an idea: Treat the wheat as a free living mulch/cover crop. Allow the wheat to grow to a taller stalk, and chop it off at ground level, and leave the new mulch laying on top of your straw. It will dry and continue mulching your tomatoes. No big deal. And if it re-grows, repeat the chop and drop. This will work fine. The grain plants will die at the frost, and your problem will be solved. For next year, along with newspapers, use clean cardboard for your grould layer, and any of the grain plants that survived the winter won't be able to grow through the cardboard. I do this all the time to supress weeds in new garden beds. Hmm are you sure that its Wheat / barely cos in our garden we have the same thing or at least looks like it and it turned out to be grass…. Rake out as much of the straw as you can from this area. Put a single layer of cardboard over the grass/wheat/barley to smother it. Put the straw over the cardboard and water to keep cardboard from blowing away in the breeze. I typically use cardboard and/or newspaper in the walkways of my garden and cover with shredded pinebark mulch. This makes it very easy to work and get around in the garden even when the ground is very wet. It also makes for a more attractive garden which is visible to many neighbors. I do it more often, securing my plants from insects. Anonymous: I've referred your Q about iPhone friendliness to the blog supervisor. I'm a technically challenged gardener.